- Guest contributor Brooke Hubler is the General Manager of Hubler Chevrolet in Indianapolis, Indiana. As the third generation of the Hubler Automotive family, Brooke brings a lifetime of experience and a well-rounded education from Sarah Lawrence College to her dealership. She helped launch the group’s online presence with DriveHubler.com and continues to bring innovation to the 10 location Hubler Automotive Group. She writes as a guest contributor on family, shopping, and automotive industry issues. Last week, I talked about finding the right car with the right features for your family. This week, we’ll discuss what you need to do to prepare that vehicle for your baby and how you can continue to keep your car safe as your child grows. I know the importance of making sure my child is safe and sound during any car trip, short or long. In the months leading up to our son’s arrival, my husband and I made sure our home was going to be safe and hazard-free. Of course, we didn’t ignore the car. When it comes to the safety of your newborn, there are many ways to ensure that any car ride is as safe as possible. As your child grows, you will have to adjust your safety measures and ensure you’re taking the proper precautions. Before Arrival: Before the big day, you need to make sure your car is all ready to go. This means purchasing the best car seat for your child and your vehicle. When browsing different car seat selections, gather information on safety tests, dimensions, and versatility to ensure that it is safe and will fit inside the car you will be driving. Along with purchasing a good car seat, gather and remove or secure any loose items inside the cabin of your vehicle. This ensures the safety of all passengers in the event of an accident since you won’t have to worry about airborne objects. I’d also recommend replacing the vehicle’s air filter to rid the cabin air of any unwanted dust and dirt particles. To ensure all-around safety, make sure all airbags and seat belts are working properly. You should also consider putting your car seat in the middle, not on the side. While this may be inconvenient and make getting your child in and out more difficult, it puts them further away from the side of the vehicle in the event of a side-impact crash. Don’t forget, your local fire department or police department will gladly help you double check your work. First Year: As your baby starts to gain head control, you’ll need to make sure that they are propped up safely. Most car seats have head control cushions built into them, but some don’t. If your infant needs extra head support, you can purchase a head or head and body support insert for the car seat. Make sure that you always put the car seat in the back seat, facing the rear. This is standard safety protocol and ensures your child will be as safe as possible in the event of any unfortunate accidents. Most cars manufactured after 2003 have LATCH systems built into them; if your car features this system, learn how to use it properly and effectively. When you strap your child into his or her car seat, it’s important to ensure that your baby is as comfortable as possible. Comfort will alleviate any potential antsy-ness. 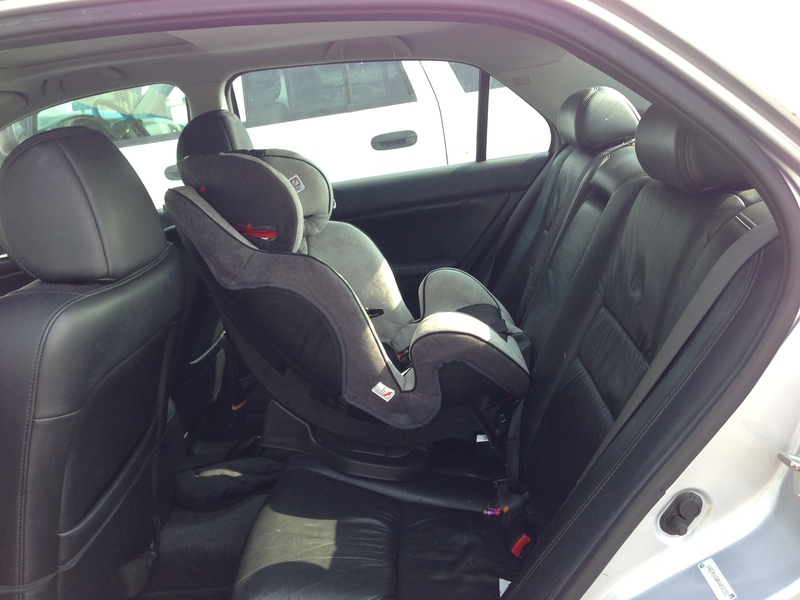 Some parents opt for cushioning devices that are not a part of the car seat they have. I would suggest that all parents only use products that are original parts of the car seat or are designed to be added onto them. When it comes to the safety of my child, my husband and I make sure we have everything in order before even turning the key in the ignition. Any new and expecting parents should take stock of their cars to make sure they’re providing the safest possible environment for their child. What have you done to prepare your car for your child? If there is anything you think I’ve forgotten or would like to share, please feel free to comment in the section below! Posted in Kids, Laws, Lifestyle.